This clock is made from a solid block of sapele hardwood and is as much an individual art piece as a functional time piece. Sapele has a beautiful grain so that each unit is unique. The main body is carved from a single solid block of wood. It is NOT made from a veneer or laminate. A word clock spells out the time in words rather than numbers. 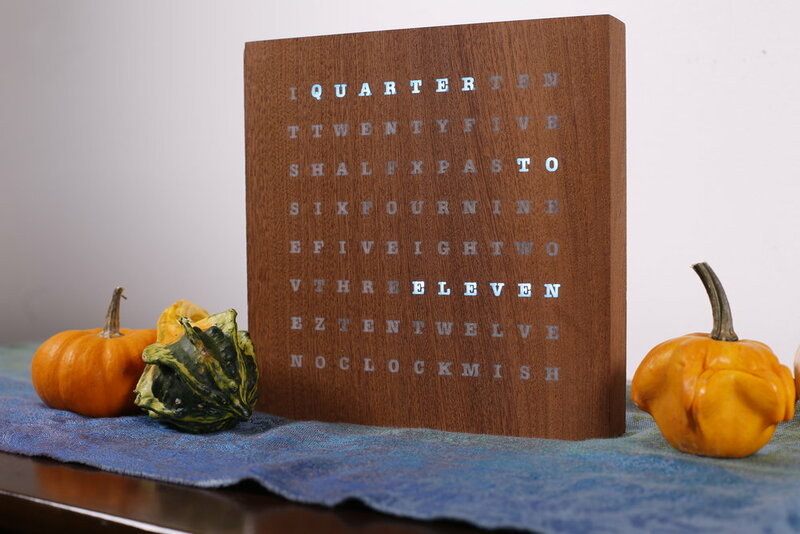 Our latest word clock design tells the exact time every 5 minutes. The two minutes before and after the exact time have an "ish" added to the time. So 3:25 is displayed as "Twenty Five Past Three" and 3:24 is displayed as "Twenty Five Past Three Ish"
This design is a limited edition. Only 100 of these units will be sold and a numbered certificate of authenticity is included with each order. The artist's goal with this design is to make a timepiece which will inspire conversation and also impress with its level of finish. This is not a hacked together DIY project. Nor is it a cold, factory produced metal and glass piece of electronics. Each timepiece is a marriage of art, design, and engineering, from start to finish. The artist plans the field of letters, hand picks the finest wood, and composes the program for the LED illuminated times. The artist hand selects the individual block of sapele wood, which is then carved using a router, making spaces for the LED lights. The face of the clock is carefully milled to a flush finish. Handcrafted with care, each word clock is made in our home workshop. Once it is tested, your fine word clock is ready to join you at your home, your office, or given as a special gift. 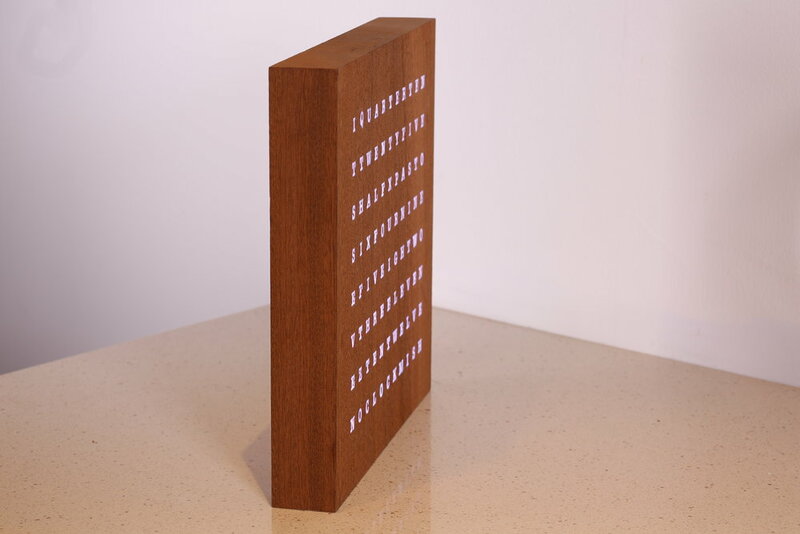 Each of the 88 LEDs are controlled individually by a small, internet enabled micro-controller to spell out the time. How is the Time Set? This word clock connects to your wifi and gets the time from the internet. A button on the back of the clock allows you to set your timezone. Read the full directions. How is the Color Set? A button on the back of the clock toggles between all the color options. Read the full directions. Each of these word clocks is proudly made by Matthew Zimmerman in Rhode Island, USA. He uses a bunch of cool tools at the AS220 Labs (www.as220.org) and puts them together in his basement workshop.